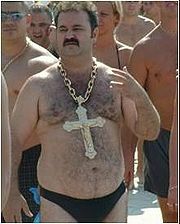 Disgustingly fat and hairy Christian man parades in his Speedos. Speedos are a sensible and comfortable swimsuit that should be worn by all men. Just ask the Europeans. The Speedo was created by Australian Terrance Speedo (born 1928) in 1969. It was always Terrance’s dream to become a male model, ever since he was 4 years old. So, when he had finally turned eighteen, Terrance entered the office of the biggest modelling agency around. But alas, they turned him down, mainly because he was 40 stone and incredibly hairy. But to a disillusioned young Terrance (he was also on quite a lot of drugs), he interpreted this as race hate because of his ewokian origins, and labelled them racists. This led Terry on a mission, a mission top make the 'dirty motherfucking racists pay.' Terry spent years trying to come up with an effective method of ruining the agencies business.All the research came to no avail, until, on his holiday at the beach in his knee-length boxers, he got into a fight with a crab (he was a very temperamental young man) the crab snipped his boxers into a snug, tight fitting pair of briefs. Unfortunately, Terry lost his right eye in this incident, he did, however come up with a source of inspiration when he saw some woman puke her guts out all over the beach at the sight of him in these briefs. Terry's plan was simple and effective; he would follow the agency around, stepping just in shot of a photo shoot whenever they tried to take one. The sight of a fat hairy man in short pants frightened a lot of the agency's clients. And they were out of business in a matter of days after he started. But this wasn't enough for a power hungry Terrence, he was still angry, he wouldn't stop, it escalated to the point in which the CEO of said agency couldn't take a family photo without the hairy figure looming into frame. The success of the briefs drove Terry to release them in selected retail stores for fat bitter people, under his second name: Speedo. At his 80th Anniversary party, Terry created the one-piece swimsuit for men- the LZR Ricer. Fashion critics have called the LZR Ricer as a revolutionary fashion item. A person would experience any of the following symptoms when seeing a man wearing speedos only if he or she has a severe mental illness for which they should have been hospitalized beforehand. A sane human being would have no symptoms at all. Whispering and pointing at subject. If you were to experience any of these symptoms commit yourself to a mental asylum immediately!! Advocating the killing of men for wearing a speedo is never funny. Although uncommon (unless you happen work on a beach/by a pool/in a public school) contact with speedos could happen in the workplace. Because of their harmful effects they were originally banned, with marksmen stationed on any building oppisite to said workplace, ready to shoot on sight anyone entering the bulding weilding speedos. However, a Christian 'right to speed' march (1978) made much progress in the field of wearing speedos to work. This march ended with 6000 civilian casualties after the marksmen got all hot and flustered. From that day onwards a national holiday has been employed to pay respect to those caught in the shooting on that dark sunday.